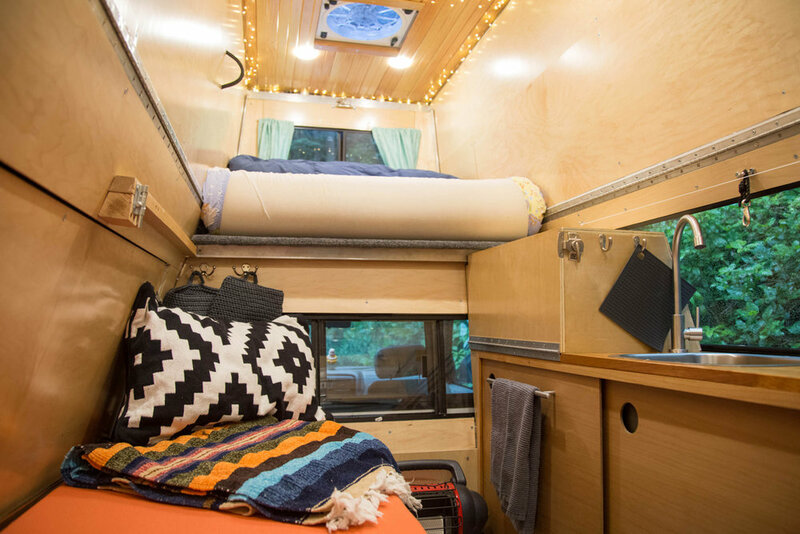 This camper was built by Tyler Thomson and Erin Sofinowski on a budget of $6000. The couple had previously used a more common truck cap with drawer system and futon mattress setup. This experience guided them as they built Adventure Truck 2.0. The foundation of this camper began with an aluminum contractor's cap with an internal square tube cage. The aluminum skin was removed and the top portion was removed to make room for a custom pop-top. While in travel-mode the camper looks as unassuming as any ordinary commercial topper. A series of latches on each corner keep the top securely closed while four struts assist in raising it up for camp. Each side wall consists of two pieces which are hinged together allowing them to fold on top of each other as the roof is lowered, and expand when it's opened. The front and rear panels are hinged at the base and fold up to secure the side walls in place. The interior panels are constructed from tongue-and-groove fir and plywood which creates a bit of maritime flavor. Illumination duties are carried out by a ring of LED lights wrapped around the ceiling, while a large fan draws in fresh air and reduces condensation. Cooking is performed on a Camp Chef grill -which allows for cooking outside, or inside, beside a stainless sink. The kitchen has a fair amount of space for food prep and water storage (grey/fresh). The box on the countertop provides extra storage with the drop-down door doubling as a table or desk. Pictured above is the frame for the ambulance style doors. This provides easier ingress/egress and saves a few pounds by shedding the tailgate. It also provides a space to mount spare water and fuel. The frame for the pop-up portion of the camper is pictured below. Each piece of square tubing was meticulously cut to length then welded together. All of this work was performed in a very generous friend's garae. We could all use a friend like this, right?!!! The attic space provides for a comfortable place to rest, while the bench below doubles as a second sleeping platform. This bench also provides storage for Tyler and Erin's extensive cache of climbing gear, clothing, a house battery and battery management system. The upper bed slides out of the way during the day to allow room to move about, or a place to hide in case of foul weather. The sheer amount of space inside this camper is impressive -especially once you consider that it's mounted to the back of a Toyota Tacoma! Strategically placed windows and other warm elements give the interior an inviting if not airy feel. Considering their budget and a build time of only three months, I'd say that Erin and Tyler have done an exceptional job of outfitting their Tacoma. 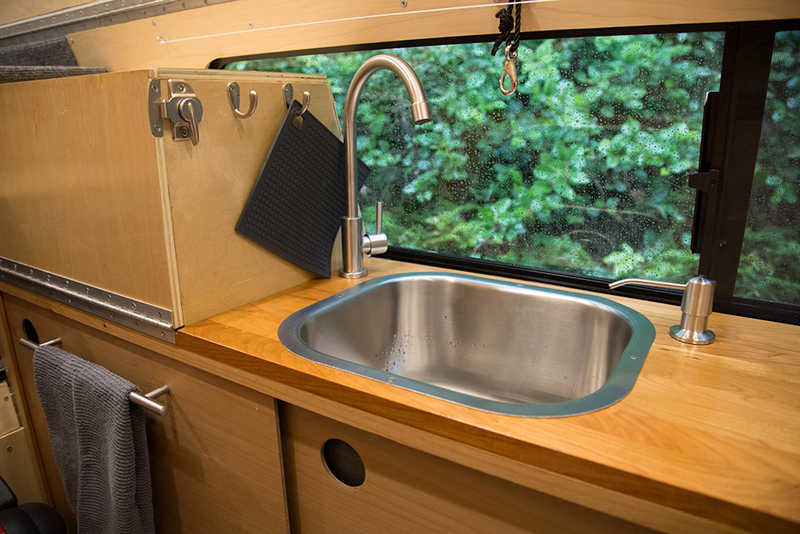 You can find a more detailed account of the camper build by clicking here. And follow Erin and Tyler on their Instagram: @get.the.truck.out for updates.